A near future. The political situation in the world is tense to the limit due to an extremely unpleasant incident: in the skies over Eastern Europe, an American rocket was hit by an airliner making a commercial flight. As a result of the disaster, all those who were on board were killed. The US government has officially declared its non-involvement in the incident. One of the most experienced agents of the US intelligence services, Michael Torton, is charged with the task of conducting an investigation and finding the perpetrators of the tragedy in order to prevent an emerging international conflict. In the project Alpha Protocol, the player gets the opportunity not only to fully control the actions and behavior of the protagonist, but also to determine his attitude to what is going on, which will affect the development of events. The modern combat system implemented in the game is designed for rapid decision-making. 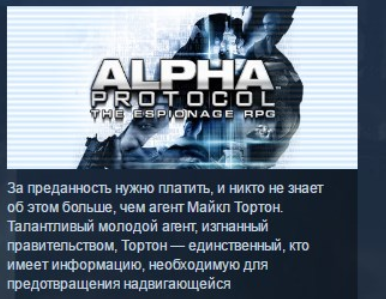 These interesting features, combined with the possibility of intensive hero development and innovative role-playing elements, carefully thought out plot that can compete with the best works in the genre of spy action, as well as a detailed virtual world where the full effect of presence is provided, allows us to call the Alpha Protocol a role-playing game of the new Generation.